Since we will be working from home, we are able to choose the city we will live in. That’s a pretty daunting task for people who have never even been to the country before. We started by researching dialects and found that the Spanish spoken in Andalucía is the most similar to the Latin American dialects prevalent in the States. So we had narrowed it down to a region, then we decided that we wanted to live in a town that was inhabited primarily by Spanish natives, not Expats (since we want to focus on learning Spanish), and not a huge city nor a really small village, but a town with some amenities and good access to trains that will get us to major cities and airports. So we began looking for towns with populations around 30,000 in that specific region and stumbled across the city of Ronda, and fell in love with it immediately. Ronda has a really interesting history, it is where bullfighting originated and the original bullfighting stadium is still in use, and it is simply gorgeous! 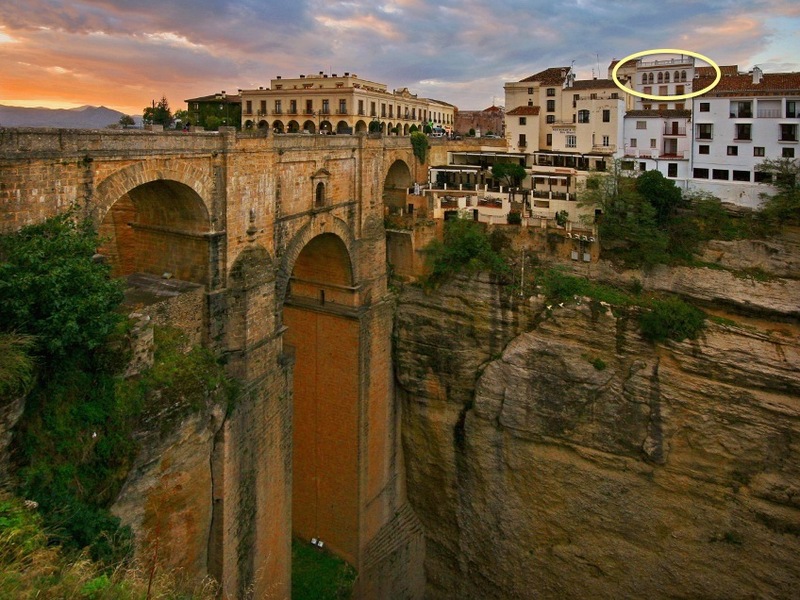 This is the famous bridge over the gorge in Ronda, and the circled windows and terrace are our apartment. We will have 3 bedrooms and a rooftop terrace with an amazing view (and only a block from the bullfighting stadium and tons of tapas bars), so we have plenty of room for guests! We couldn’t be more excited to get there and start our life in Spain!! Next Next post: And we’re off! !